viii, 109 leaves : ; 29 cm. faith and understanding will always be cherished. not have persevered in completing this work. Chairman: Nancy K. Norvell, Ph.D.
and physical and psychosocial impairments. isometric strength on the MedXT at the end of 12 weeks. pain and improves physical and psychosocial functioning. abnormalities but also on the surrounding soft tissue areas. to a perceptual experience caused by a noxious stimulus. associated with the chronicity of pain. difficulties and some continue to function well in society. exhibiting a "chronic pain syndrome." hyperactivity (Flor & Turk, 1989). estimated stimulus intensities, and autonomic reactivity. to a pain-tolerant model versus a pain-intolerant model. the influential role of social-environmental mediators. frequently report depressive symptoms (Weisenberg, 1977). Mayer, Capra, Diamond, & Barnett, 1986). (Chaturvedi, Varma & Malhotra, 1984; Turk & Kerns 1984). patient presenting with the chronic pain syndrome. explaining the chronic pain experience. psychological and social phenomena as a prominent factor. as the predominant working model (Waddell, 1987). its relationship to the later development of chronic pain. factors than physical disease (Waddell, 1987). the contingencies of reinforcement to well behaviors. psychological concept of operant conditioning. undesirable consequences for certain pain behaviors. negative social reinforcement from significant others. with a physical component--increased activity (Block, 1982). to produce significant improvement in chronic pain patients. outcome (Deyo et al., 1988). physical therapy treatment or to a behavior therapy program. the two groups at 6- and 12-month follow-ups. and are not candidates for surgical interventions. functioning and increased activity (Weisenberg, 1987). conducted within an experimental design (Tan, 1982). and for disability determinations (Mayer et al., 1985). and excessive protection of the spine (Mayer et al., 1987). the chronic pain patient's avoidance of physical activity. spite of functional abilities (Dolce, 1987). activities such as walking, running, and climbing stairs. performance than the subject's actual running history. patient develops avoidance behaviors independent of pain. pressor test for pain stimuli reached similar conclusions. endogenous opioid involvement following pain stimulation. increased both their self-efficacy and pain tolerance. Moletteire & Doleys, 1986; Dolce, Crocker, & Doleys, 1986). (Dolce et al., 1986a; Dolce et al., 1986b). (pain) and emotional reactions (such as stress and anxiety). be a precipitating factor (Keefe & Gil, 1986; Linton, 1987). stress (Flor & Turk, 1989). and to improve adaptive interactions with the environment. well-being (Folkins & Sime, 1981). (Coleman, Price & Washington, 1985). decreased depression compared to a wait-list control group. groups at a one year follow-up. exercise (Sinyor, Schwartz, Peronnet et al., 1983). disciplines, and a variety of differing interpretations. increasing physical functioning (Bigos & Battie, 1987). fat, and increased aerobic fitness. extension muscles should decrease chronic low back pain. back muscles' strength to their endurance under a work load. high risk for injury to the low back (Jones et al., 1988). 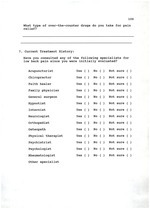 Questionnaire (MacMillan et al., 1988, unpublished data). addition, a low back pain control group was not included. treatment modality for patients with mild, low back pain. respect to mild physical or mild psychological involvement. hence predict attrition (or treatment drop-outs). were not dependent (daily use) on narcotic analgesics. accident for 83% of the sample. 1/2 the subject's peak isometric strength (torque in N.m). coefficients ranging from 0.62 to 0.91). their current pain and their pain for the last week. Depression, and Loss of Behavioral/Emotional Control. psychological well-being, and depression and anxiety. dysfunction, and other dysfunction (work and recreation). review board of the University of Florida. exercise sessions or to a ten week wait-list control group. to a wait-list control group. exposure to the training machine. at a work load of 1/2 the subject's peak isometric strength. pain rating prior to their second lumbar strength test. protocol as the experimental group. resulting from the generated force curve for each subject. post-treatment were used as the dependent variable. their relationship with the post-treatment intercept. demographic variables or pain histories pre-treatment. of the protocol between the control and treatment groups. treatment change scores on the physical dysfunction scale. routine exercise regimens on the activities questionnaire. stress, anxiety and depression, or psychological well-being. reporting an increase in pain (F(2,51)=6.83, R < 0.002). adherence to the exercise program, and therapeutic gains. associated with attrition could not be ascertained. may be reflective of a simple regression towards the mean. the chronicity and disability reported by this sample. no differences or changes in daily activity levels. related to significant changes in self-reported pain. predictive of post-treatment strength changes. following only 14 exercise sessions over a 10 week period. post-treatment standardized the data for group comparisons. the regression lines were utilized for measuring change. discrepancy in the linear relationship is no longer evident. the intercepts of the control group and the treatment group. testing positions were found to vary a few degrees. covariance with changes in torque as the dependent variable. control group remained the same. a change in one subscale resulted in a change in the other. weekly activity levels, depression and anxiety, or stress. abilities does not readily result in increased activities. pre-treatment, it appears to be a reasonable hypothesis. workmen's compensation for their primary source of income. and stress in this patient population. control group's report of pain continued to escalate. turn, they seek external resources for meeting their needs. activity level, and external and internal locus of control. variable and accounted for 19 percent of the variance. syndrome population has not been clearly documented. exhibit beneficial changes with lumbar extension exercise. given the high levels of dysfunction. health care system associated with this population. of exercise in the rehabilitation of chronic pain patients. multivariate analysis of variance could have been utilized. beneficial changes in activities and psychological distress. positive impacts on future performance and disability. in strength as well as increases in range of motion. of Clinical Psychology, 76, 223-228. Personality and Social Psychology, 53, 563-571. Orthopaedics and Related Research, 221, 121-130. Blackwell, B., Galbraith, J.R., and Dahl, D.S. (1984). Jr., Vranizan, K.M., Farquhar, J.W., and Wood, P.D. Journal of Medicine, 141, 691-694.
measurement: An overview. Pain, 22, 1-31. Chaturvedi, S.K., Varma, V.K., and Malhotra, A. (1984). Assessment, (pp. 15-25). New York: Raven Press. and Social Behavior, 24, 385-396.
adult women. Perceptual and Motor Skills, 60, 737-738. (Eds. ), Perspectives on Behavior Therapy in the Eighties. (pp. 311-327). New York: Springer Publishing. Medicine and Rehabilitation, 69, 174-178.
sport. Medical Clinics of North America, 69, 123-143. Dolce, J.J., Crocker, M.F., and Doleys, D.M. (1986). Behavior Research and Therapy, 24, 313-319. Dolce, J.J., Crocker, M.F., Moletteire, C., and Doleys, D.M. treatment. Psychological Bulletin, 97, 502-520. McDougall-Wilson, I.B., and Neimeyer, R.A. (1987). Ewart, C.K., Taylor, C.B., Reese, L.B., and DeBusk, R.F. Feuerstein, M., Papciak, A.S., and Hoon, P.E. (1987). Biobehavioral mechanisms of chronic low back pain. Clinical Psychology Review, 7, 243-273. Feuerstein, M., Sult, S., and Houle, M. (1985). events, family and work environment. Pain, 22, 295-307. Folkins, C.H., Lynch, S., and Gardner, M.M. (1972). Psychological fitness as a function of physical fitness. in chronic low back pain. Pain, 21, 67-76.
chronic back pain: A search for outcome predictors. physical functional restoration. Spine, 11, 36-42. Hockersmith, V., Kleeman, M., and Wagner, J. (1977). extension strength. Spine, In Press. Reeves, V., Reid, S., and Frymoyer, J.W. (1989). perceptions. Journal of Behavioral Medicine, 8, 61-78.